If you had seen Lisa Kulik and her husband strolling the grounds of the University of Southern California’s Eye Institute last summer, you would have thought nothing of it. But for Kulik, that simple walk around the campus was “a miracle.” Blind for more than two decades from an inherited eye disease called retinitis pigmentosa, Kulik was seeing again — clearly enough to make out the sidewalk and the grassy edge — thanks to a sophisticated microchip implanted in one of her eyes. For years, Joe Vellone, 76, watched his sight gradually deteriorate from age-related macular degeneration (AMD), a condition in which the light-sensitive cells of the macula — the central part of the retina — are destroyed. “My vision was so bad I’d walk right by people I know because I didn’t see them. I couldn’t read at all,” says Vellone, who lives in Somers, N.Y., with his wife. The shots have one big drawback: They have to be administered as often as monthly. 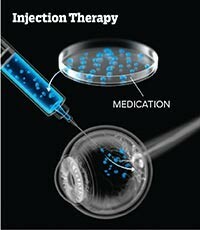 To eliminate repeated injections, researchers are developing innovative ways to deliver medication to the eye. One approach under investigation is to implant a small reservoir that steadily releases medication over time, says Heier. Another, more dramatic possibility: using gene therapy to reprogram cells in the eye to produce their own anti-VEGF agents. The holy grail of research to treat macular degeneration, though, is finding ways to regenerate healthy cells to replace those damaged by disease. That may not be far off. In 2014, a team at the Jules Stein Eye Institute at the University of California, Los Angeles, reported early success growing retinal cells in the lab and injecting them into the eyes of patients with several different forms of AMD. The scientists began with pluripotent stem cells, which have the ability to become any cell. “Over a period of months, the cells are coaxed into becoming retinal pigment epithelial cells, which support the photoreceptor cells in the retina,” explains Eddy Anglade, M.D., chief medical officer for Ocata Therapeutics, the Massachusetts-based company that is developing the procedure. Early results show significant improvements in vision in some patients, and clinical trials are under way to refine the procedure. The “bionic eye” that restored some of Lisa Kulik’s vision uses a tiny video camera mounted on glasses to transmit light signals to a microchip implanted in the eye. The microchip then relays that information to the brain, though it collects only a tiny fraction of the information a healthy eye receives. “But that’s enough to help people who have been blind see large objects and make out outlines,” says University of Southern California ophthalmologist and biomedical engineer Mark Humayun, who helped develop the Argus II. The device has so far been approved by the FDA for retinitis pigmentosa, an inherited disease that affects about 100,000 Americans, although it may have broader applications in the future. Using a different tack, researchers at a California-based company called Eos Neuroscience have successfully inserted beneath the retina a gene that enables cells to capture light. The goal is to engineer healthy eye cells to take over for photoreceptor cells that have been destroyed by retinitis pigmentosa or macular degeneration. Experiments in mice have shown that the inserted gene allows blind mice to use light to guide themselves. Human trials may begin soon. As an alternative to drops, Ciolino and his colleague Daniel Kohane, M.D., who directs the Laboratory for Biomaterials and Drug Delivery at Boston Children’s Hospital, have developed a contact lens that contains glaucoma medication sandwiched by a thin polymer film. Studies completed last year showed that the lens releases a steady and consistent dose of medication for up to a month. The drug-delivering lenses can also be laced with antibiotics or anti-inflammatory medications in order to treat infections and other eye conditions. And as an added benefit, the lenses can be designed to correct vision problems like near- or farsightedness, which would provide additional motivation for people with glaucoma to use them. Other innovative approaches are under investigation. Researchers are developing implantable devices that can measure pressure within the eye and deliver precise doses of medication to control it when it rises too high, for example. And ongoing research with stem cells and gene therapy could provide tools to regenerate healthy optic nerve cells, undoing the damage caused by glaucoma. With diabetes on the rise, ophthalmologists have begun tracking a dramatic increase in one of its consequences — the sight-robbing disease called diabetic retinopathy. Nationwide, diabetic retinopathy is now a leading cause of blindness among adults 20 to 74, affecting more than 4 million Americans. Elevated blood sugar levels associated with diabetes gradually damage cells in the retina, eroding sight. Just in the last year or two, doctors have begun to use the anti-VEGF drugs approved for wet AMD to protect against diabetic retinopathy. But the latest sight-saving drugs are effective only if people know that they have progressive eye diseases. Many don’t. When University of Southern California ophthalmology researcher Rohit Varma, M.D., studied Hispanic residents of Los Angeles a few years ago, he found that one-quarter had type 2 diabetes and half of them had signs of eye disease — yet a majority were completely unaware of the danger. “We’re making tremendous progress,” says Varma, who directs the USC Eye Institute. Peter Jaret is an award-winning health and science writer in California.